Provide comfort for the family of June Coryea with a meaningful gesture of sympathy. 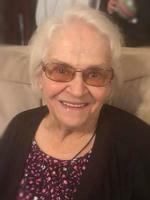 June Marion (Bulriss) Coryea, 86, passed away on February 5, 2019, knowing she was beloved and cherished by family. One of 13 children, she dedicated her life to raising a family of her own. She was mother to 8 children: Anna, Eugene (Bertha), Clifford (Sepha), Thomas (Brenda), Carrie (Ronald), Fred, Carol, Maurice (Joylynn) Jr., (Sharon). In life, June was the most proud of being an adoring Grandmother to 31 Grandchildren: Walker (Kristen), Jessica (Carl), Crissie, Clair (Shane), Charles (Amanda), Thomas (Jaime), Keith, Constance (Dominick), Carl, Kristine (Nick), David (Katie), Michelle, Roger (Lori), June, Dawn (Rick), Clifford (Jamie), Maurice (David), (Carl L), (Katie S); 29 Great Grandchildren: Ashley, Tyler, Brayden, Emma, Seth, Gavin, Kolton, Kaleb, Karson, Barrett, Rusty, Macy (Gary), Katie (Tyler), Casey, Coriana (Dustin), Brandon, Rhiannon, Benjamin, Elisa “E”, Vanessa, Brooke, Rory, Mekenzie, Makaya, Richard, Alexander; And 4 Great-Great Grandchildren: Aubree, Jaycee, Korbin, Trey. She was also excited to hear about a new great-great grandchild expected this year. In 1950 and newly married, June and her multi-talented craftsman husband, Maurice, set up their home in Tupper Lake, NY. In 1963, as their family continued to grow, they relocated to Holmes, NY. She took great pride in the home they established there while also maintaining a job at the Harlem Valley Psychiatric Hospital. In the early 1970’s, they moved to Kiyiwana Farm in Stormville, NY, where family events mingled with farm life; hay baling and summer barbecues, July 4th fireworks over the lake, as well as countless birthday and holiday celebrations. She reveled in the hard work, children and laughter that were abundant through those years. Retirement meant moving back to their north country roots, settling in Ellenburg Center, NY. Once again, she flourished in working together with her husband, and the help of family members, to make their house and property their own. She enjoyed the relaxed pace of a hobby farm and the continued, ever expanding family gatherings for many years. Generous in nature, June always made sure her family was loved and cared for throughout her life, making sacrifices as only a parent would. Dozens of photo albums she assembled with love have chronicled her life’s stories. June was predeceased by her loving and devoted husband, Maurice H. Coryea, Sr.; two sons, Fred and Eugene; grandson-in-law Carl Houghtaling; great granddaughter, Emma Grace; and a great-great grandson, Trey Daniel. To send flowers in memory of June Marion Coryea (Bulriss), please visit our Heartfelt Sympathies Store. Provide comfort for the family of June Marion Coryea (Bulriss) by sending flowers.